Specially for people who always seek for adventures! Three wonderful days in the secret island Nusa Penida! More emotions, more memories! Renew your tan, enjoy nature and calm your soul. Are you ready? Which adventures are waiting for you? Atuh Beach will be the next spot on your map. Calm bay and inviolable cliff walls guard this wild white-sanded beach against unwelcome guests. Only special people can enjoy breathtaking views of this place. The final spot of this day will be Goa Giri Putri temple. In Bali, a lot of caves are temples and places of worship. There is a cave like that in Nusa Penida – Pura Goa Giri Putri. In English “Giri” is “mountain, hill” and “Putri” is “daughter”. “Daughter” is a symbol of God power, maternity, and feminine energy. Goa Giri Putri is a home for Divine forces. Hindu went to this place to pray, practice yoga and meditate. The temple can house 5,000 people at once, just imagine its size! 16:00 Relaxed and happy you will go back to your hotel to enjoy photos you’ve taken, have a good rest and prepare yourself for one more day of new experiences. 7:00 am. t’s time to continue your adventures and go to safari! Where will you go? 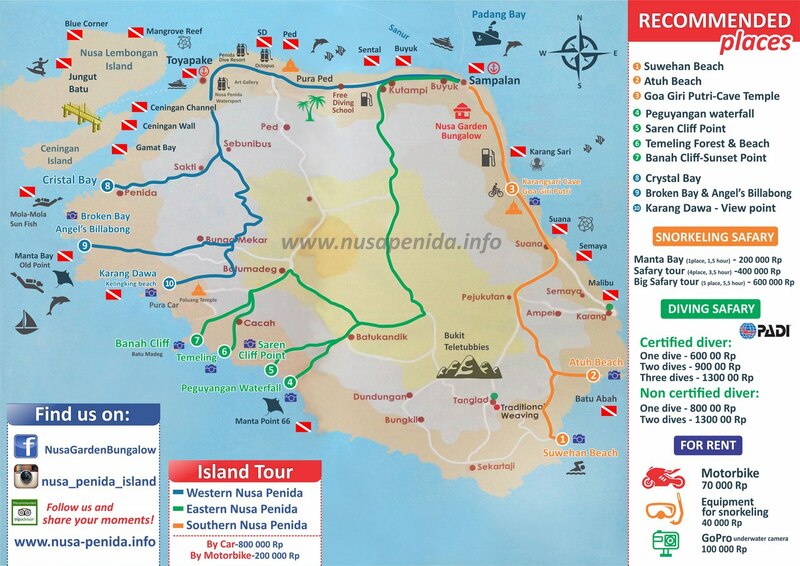 Today you will have the opportunity to see the real beauty of Nusa Penida underwater world. 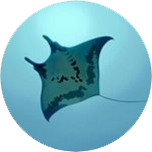 You will visit 4 hottest spots for snorkeling and diving: Crystal Bay, Manta Bay, Gamat Bay and Wall Point. The next spot of your adventure will be Broken Bay or in Pasih Uug Balinese language. The bay looks like a huge pool, the sea is surrounded by tall inaccessible rocks and hidden from curious glances. The unusual look of this bay is the result of volcanic activity, the beach seems to be “caught in an invisible trap”. That allowed to nature to create an enormous swimming pool which is truly unmatched. Visiting Karang Dawa View​ Point, you will discover a scenic view to stately ocean and the time will slow down to make you enjoy this moment when silence, beauty and greatness keep together. Down below concealed under tall cliffs and hills of the island Kelingking Beach is hiding. It’s the true Paradise which make you fall in love with Nusa Penida forever. From Saren Cliff Point you will be able to see the incredible views, that you can not find elsewhere. At this locations you can also enjoy Sunrise and Sunset at once. Saren Cliff Point offers you an excotic panoramic cliff, underneath there can see a clear of blue sea water of ocean waves.to the surprise there is a swing, where you can have fun remembering your childhood and enjoy the sights of rocks and beautiful cliffs.To remember these moments, take photos that are sure to be very different from others. Banah Cliff Point will be the final spot in our adventure. It’s a very secluded place which almost nobody knows about. You will have an opportunity to enjoy these precious minutes of calmness and silence, mixed with the music of nature. Looking at the sea you will see a crescent formed rock and feel the insouciance brought by the ocean breeze. This is a perfect place to spend time with the person you love. - Room for 2 night. - Car to visit the island / Driver concurrently so Guide. pick up and drop off from your hotel in Bali.